Hi everyone! Welcome back for another episode from my by-monthly Yippee For Yana video series for Simon Says Stamp Blog! Today’s episode is all about watercolor! 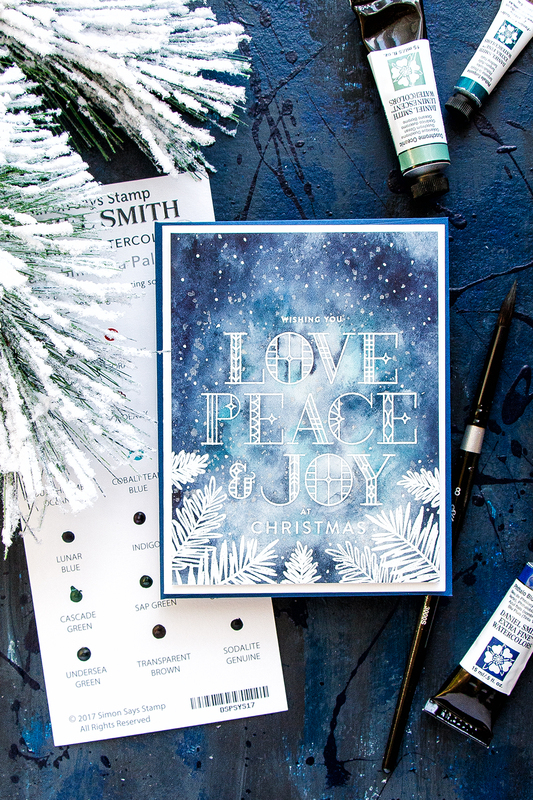 I’ve always been a fan of dark, bold colors so to create the card I’m sharing in this video I picked my favorite Lunar Blue and Indigo colors from Daniel Smith and watercolored a background. 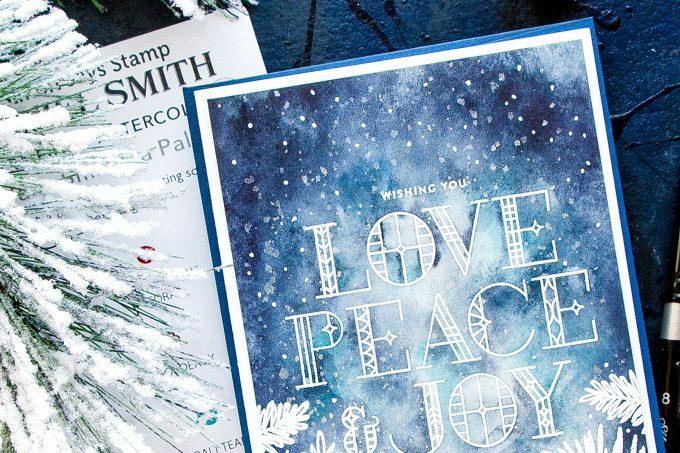 I used Stained Glass Greetings stamp set from the latest release from Simon Says Stamp To create a sentiment for this card – “Wishing You Love, Peace & Joy at Christmas”. I heat embossed it in white embossing powder onto Arches Hot Pressed watercolor paper. Next, I pulled out my watercolors (I used colors you can find in my exclusive Daniel Smith Yana’s watercolor palette) and watercolored a night sky. Be sure to watch my video tutorial to see the process from start to finish. 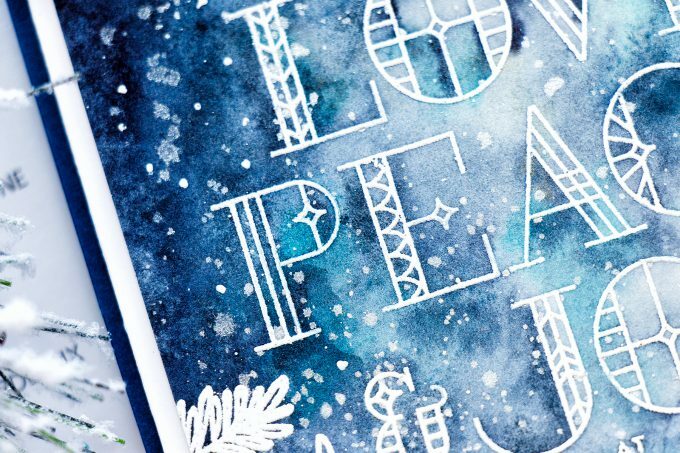 I also added lots of pearlescent splatter onto the background mimicking snow. I used my Finetec watercolors for this and also later added a lot of white dots onto the upper part of the card using a white gel pen. Once my coloring was done I heat embossed several pine branches from the Holiday Boughs stamp set from WPlus9 at the bottom part of my card. You can go all the way around your sentiment and frame it with these heat embossed branches or you can also stamp branches in black ink for a silhouette look. I trimmed my background to 4 x 5 ¼” and foam mounted onto an A2 side folding card. While this card took quite a bit of time to make (the watercolor process took about an hour) I had a blast making. I hope you’ll give this idea a try. Have fun stamping! What a beautiful background!! Gorgeous card!! Gorgeous card! I love the contrast between the white and the dark colors! Thank you so much for sharing your process! Yana, I am so in AWE of your work, this is astonishingly beautiful! Wow, this card is amazing ! A real piece of art ! I love watching the process to creating this background. 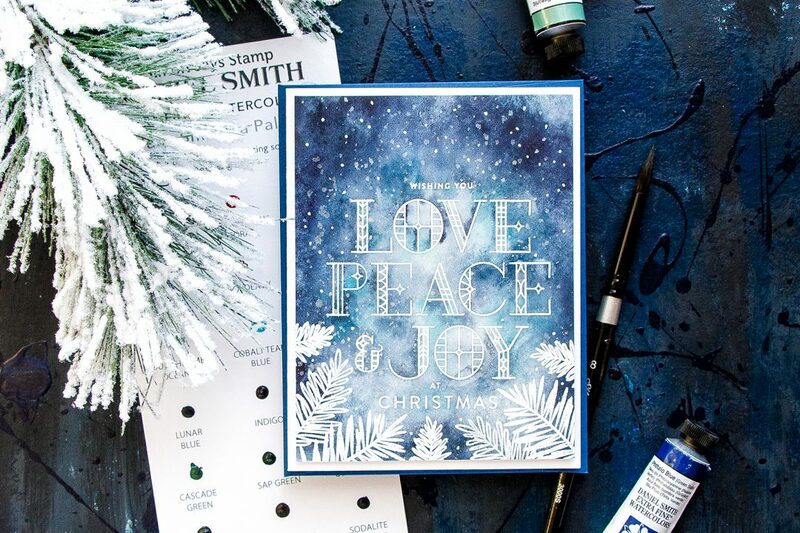 Thank you, Yana, for sharing how you moved from what you called a ‘hot mess’ to the final gorgeous card. I appreciate the tip that sometimes it is the little things, like the snow in this instance, that pulls it all together! So true about the Arches, there is no going back and even beginners should use it because they will have more success. This is also true of fine watercolors like Daniel Smith. Yes, they are expensive but if anyone is serious about developing their watercolor skills they will immediately see the difference. Your card is lovely and I enjoyed the video. 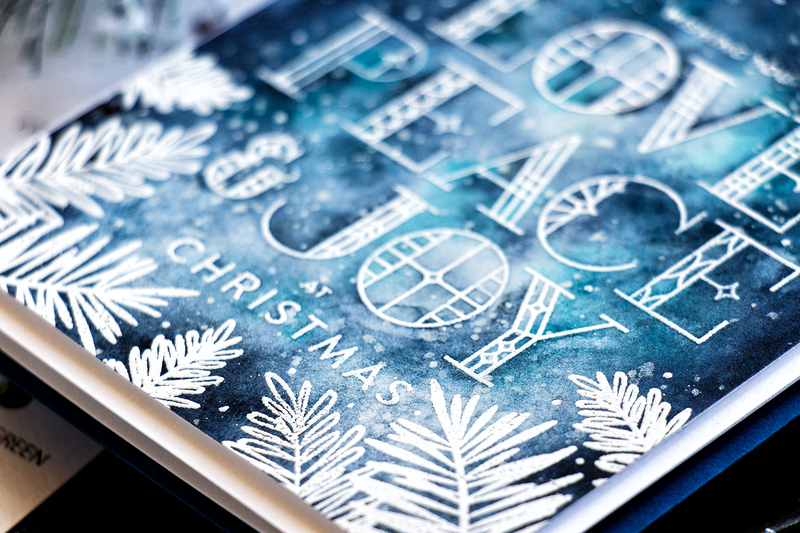 I am most impressed by your white heat embossing–with this I have had no luck! 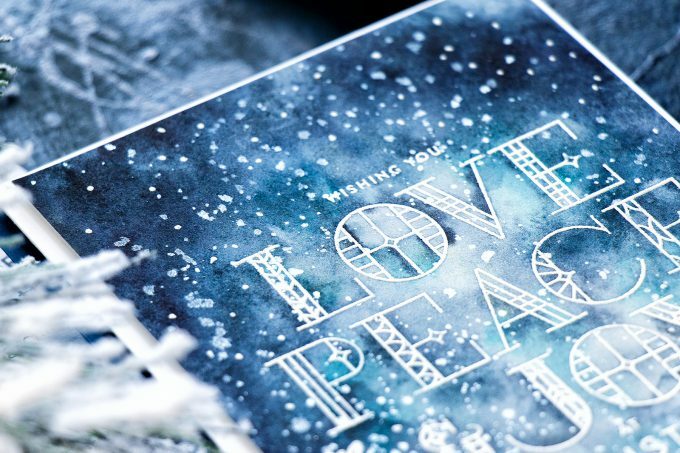 I saw your card over onto the Simon’s blog and said it was completely stunning ! !